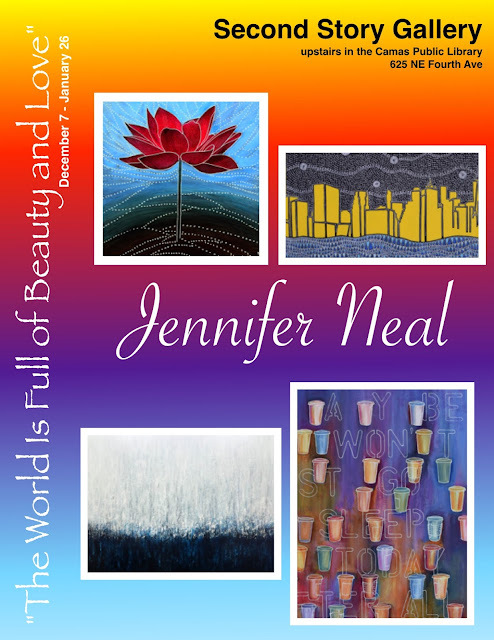 Second Story Gallery will hold an artist reception at a special time Dec. 7, with the intent to attract visitors to the new show by Jennifer Neal before the festivities begin with Hometown Holidays. The Gallery will offer music and treats as part of a “twilight” artist reception from 4 to 6 p.m.
Neal’s show, “The World is Full of Beauty and Love,” will be unveiled that night and remain on display through Jan 26, 2019, in the Gallery upstairs in the Camas Public Library. Neal’s bold paintings will be on exhibit through Jan. 26 during regular library hours, 10 a.m. to 8 p.m. Monday through Wednesday, 10 a.m. to 6 p.m. Thursday through Saturday.